U.S. aid officials are launching a new way to measure whether their efforts to empower women farmers are working. Women make up nearly half the agricultural workforce in sub-Saharan Africa and East and Southeast Asia, but women’s farm production tends to lag behind their male counterparts. Women face a number of obstacles that men do not. They tend to own less land and have fewer rights to that land. They have less access to credit and training. And they have less input in decision-making. Aid agencies including the U.S. Agency for International Development see women’s empowerment as key to meeting that goal. Farmer Celeste Sitoe raises maize and chickens in Lhate village, Mozambique. To help evaluate their efforts to fight poverty and hunger, USAID called on experts at Oxford University and the International Food Policy Research Institute (IFPRI) to identify ways to measure women’s empowerment in agriculture. The researchers looked at five areas: control over production, resources, and income; leadership in the community; and use of time. They compared the roles of women and men in the same household in these areas. And they did pilot studies in three very different countries: Guatemala, Bangladesh and Uganda. “What is actually quite interesting is that the areas of empowerment and disempowerment are quite different across the three countries,” says IFPRI Senior Research Fellow Agnes Quisumbing. 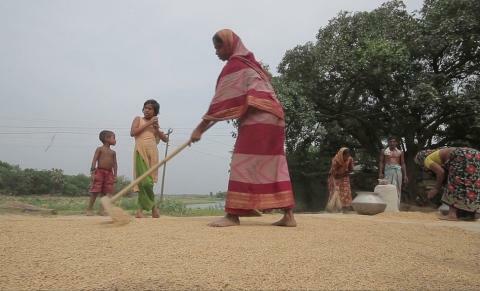 For example, in Bangladesh, researchers found the most significant factor for women was the lack of authority over resources such as land and livestock. In Guatemala, it was the lack of leadership in the community that was the biggest problem; while in Uganda, it was time burdens that proved the biggest barrier for women. A female vendor, with her child looking on, offers produce at a roadside market in Ghana. The research turned up a few surprises. “Often, we assume that empowered women are wealthy and educated and vice versa. But we found a more complex story,” says Sabina Alkire, director of Oxford’s Poverty and Human Development Initiative. Alkire says in Guatemala, for example, three-quarters of the women in the highest wealth category were disempowered. One of the most powerful aspects of this new approach is its ability to identify in which areas women are most disadvantaged, says Agnes Quisumbing. USAID’s Tjeda McKenna says the agency will base its funding and programming efforts on seeing improvements in these areas. “It very much is meant to be a practical tool for us to guide our implementation,” she says. And the experts say it will be useful as well for others working to improve women’s involvement in agricultural development. Filed Under: AFRICA, ASIA, CENTRAL AMERICA, EURASIA, EUROPE, MIDDLE EAST, NORTH AMERICA, OCEANIA, SOUTH AMERICA, WOMEN GENDER EQUITY ISSUES Tagged With: A Celebrtion of Women, Bangledesh, gender issues, Guatemala, rural women, Uganda, US Aims to Empower World's Women Farmers, women farmers, women's education, women's rights, women.